If you've been to this site before you know a few things about my cooking and eating habits. One is that I love whole wheat bread, especially Ezekiel Bread, and another is that I can--and nearly have--eat any vegetable sauteed in oil with garlic and hot peppers. This is just another example. I cooked this broccolini yesterday for a side dish for staff lunch. The recipe is below, but if you'd like additional recipes (with photos) of many other foods cooked in this fashion, click here. Heat the olive oil, garlic, and hot pepper in a skillet. When the garlic begins to sizzle and brown slightly add the broccolini, salt, and water. 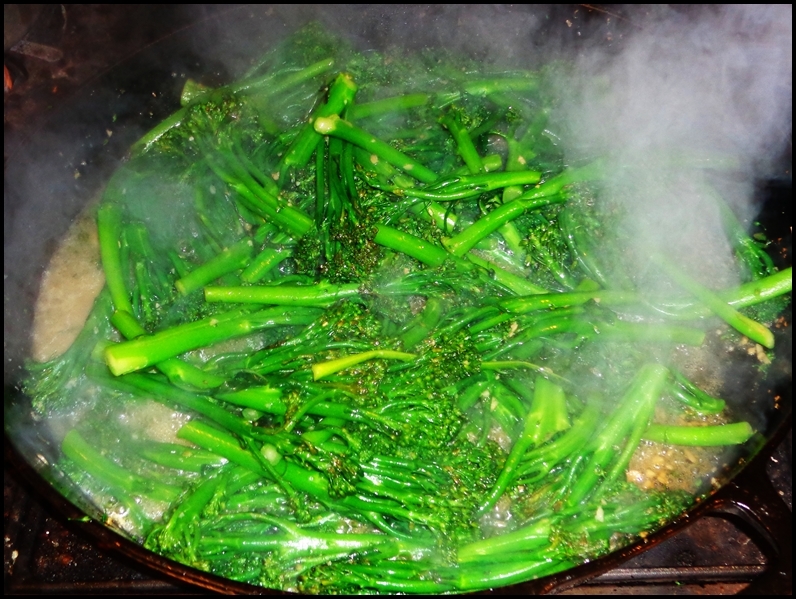 Toss and turn the vegetable for a couple minutes until most of the water evaporates and the broccolini is just cooked. Serve warm or at room temperature.